Location/ Directions:Traveling on I-81 – Exit at US 220, Exit 150-A. Travel South on US 220 and turn Left onto US 11. Follow US 11 North for approximately 300 yards and Holiday Inn Express is on the right. About Hotel: Brand New! 3-Floors, 85-Rooms, Interior Corridors, Business Center, Color Cable / Satellite TV, Stereo, Work Desk w/ Lamp, Speakerphone with Voice Mail, Free Local Phone Calls, High-speed Internet Access, Bathtub, Hairdryer, Private Bathroom, Coffee Maker, Microwave Oven, Mini Refrigerator, Double Glazed Windows, Individually Controlled Air Conditioning, Iron / Ironing Board, Roll-away Bed (fee), Windows Open by Guest about 6" without a screen. Railroad View: Fair distant view. No rooms face the tracks directly; railroad is off to the left looking out from rooms located on the front of the building. 2nd or 3rd floor rooms on the front of the building are needed for a railroad view. I had a room on the 2nd floor (Room # 227) which was fine. [Odd number rooms face the front]. Due to trees along the railroad; there is only about 300 feet of clear viewing from the motel. Windows do open about 6", which can be useful to listen for approaching trains. Tracks are about 250 feet from the motel, meaning a bit too far to read passing locomotive numbers. Northbound trains work hard (lots of noise), and move very slow. If you hear a train coming, you may have plenty of time to get outside and get a better view of it! 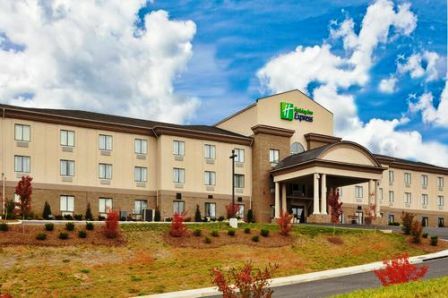 Notes: The motel is 10-minutes north of Roanoke, VA. Be sure to visit the Virginia Museum of Transportation in Roanoke, as well as taking a stroll on the RailWalk. Roanoke is very busy area to watch Norfolk Southern freight trains. Comments: I stayed here the night of July 4th, and departed kind of early on July 5th. Because of the holiday, trains were at a minimum. I was in room # 227, 2nd floor in the middle of the building. My view was fine, I don't think I would have a much better view if I was closer to the railroad, or had a room on the 3rd floor. Two train's passed while I was awake, one at night which I could only see the headlights, and one during daylight (7am, photos shown). The motel itself is wonderful, very clean, and well kept! The full buffet breakfast was great! I'd stay here again. Down the street are several places to buy fast food (Hardee's & McD's to name a couple), plus a TA Truck stop. The motel is located near I-81 (Exit # 150A), but far enough away not to hear highway noise. This is a very quiet and peaceful area, a great place to stay if in the Roanoke area. Photo Comment: The photos seen here were taken of the only train I witnessed in daylight. I checked into the motel very late, around 11pm, and fell asleep moments later. A train passed at 1:30am that woke a buddy of mine up, but I slept right through it. Around 7am I heard a train horn to the distant south (I left my window open during the night, along with the AC turned on), about 5+ minutes later the northbound train finally appeared running in Notch 8, and maintaining about 5-10 mph. It gave me time to get some pictures. Three Norfolk Southern locomotives powered the heavy merchandise train. These 3-photos were taken from room # 227, second floor - middle of the building. As you can see, the morning sun light is not great for pictures. I used a Cannon SLR with a stock 18-55mm lens for these shots. A zoom lens would have given me a better "train photo", and would likely helped me view the locomotive numbers. I was able to stick my camera out the window for the two train photos, the shots of the locomotive was taken through the glass window. There is no window screens which helps you take clearer pictures from your room. Right Photo: A wider view shows the complete railroad view from the motel. Due to trees and brush along the tracks, there is only a small area where you get a clear view of the passing trains. Fall / Winter and early spring may provide a bit more railroad view - when the leafs are off the trees.